Park hopping is a ticketing add-on that allows you to do just that- hop from one Disney Park to another on a given day. Some guests wouldn't dream of visiting the parks without hoppers, while others rarely see the benefit and remain firmly planted in one park per day. Hopping does come at an expense: in addition to the monetary piece, there's an expense of time- which for some people, is a larger issue than the dollars involved. Adding the Park Hopper option onto a ticket will cost an additional $59 per person. That price is per ticket, regardless of the number of days on your ticket. If you have a ten day ticket, that comes out to about $6 per day; on a three day ticket? Well, you can see how some deals are better than others. My park touring style pretty much necessitates park hopping. I LOVE hopping, and I have never done a visit without this option. I like the freedom it gives me. I can decide on a whim to visit a different park, and I can end the day in a completely different place than I started. Also, I really love to stay in the Epcot area resorts- and in these resorts, I find park hoppers to be especially necessary. How could I not slip in to Epcot every day, at least for a short time, when the International Gateway entrance is just steps away from my resort? I generally don't park hop on a visit of less than 4 days. (This is the same reason why I won't do a visit of fewer than 3 days, lol.) If I have less than one full day to spend per park then rather than split the day between two AND spend more money, I would rather spend one full day in one park. However, on a longer trip I pretty much ALWAYS park hop because I go at a more relaxed pace, and I love being able to tour, say, Hollywood Studios in the morning/afternoon and then go over to Epcot for dinner. So for me it's a matter of feeling like I'd get less out of it on a shorter trip, while spending more money. Especially when I don't know when I'll be back - I don't want to have less than a full day in the Magic Kingdom! Oh the monorail loop resorts are awesome :) We stayed at Bay Lake Tower on our last trip, and had an amazing time! Hopping is always awesome. When we went in April my 90 year old grandmother was with us, and all the Cast Members were so helpful when we hopped. There is almost always a courtesy wheelchair available at the park gates to get to and from the buses and monorail. I hope you have a great visit when you go :) Which race are you running? We used to go every year beginning 11 years ago but haven't been since 2009. We always hopped because it was cost effective. Speaking of hopping, I hopped over from Mommy Blogs! This is definitely something we talked a lot about in the beginning of the year when we decided to go to the parks in March. We are on a major budget cut since J went back to school and we can't just tour the parks they way we used to. I think because we went during Spring Break having the one-park-a-day passes made us feel a little stuck. The parks were extremely busy and we didn't do as much as we wanted to. But then again, we saved the money, really took in each park, and spent some time at the resorts too (something we like). We've only been once, but we chose not to get the park hopper because we had four young children with us. The hassle of travelling between parks just didn't seem worth it. We spent one day in each park and the repeated our favorite on the last day. Good info. We are starting (I should say thinking about) to plan our first trip to Disney! I don't think we'll hop, because it's going to be a shorter trip with a three year old. Can't wait to come back and get more info from your site! We always hop because, like you, we like the flexibility to break up our day by going to different parks. We also will often have a late-ish dinner at Epcot after spending the day somewhere else. For a longer trip the extra money seems worth it. But, I can definitely see that for a 3 day trip the cost in both time and money might not make sense. Thanks for sharing. We have a three year old and will probably hop when his is s little older and when we go on longer visits. 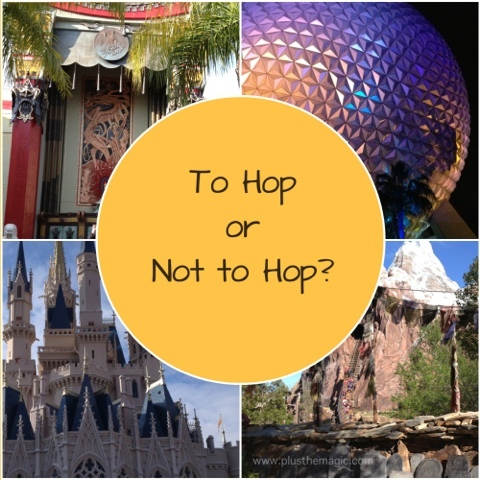 We do hop, because we also love Epcot and Hollywood Studios. I could pass on Animal Kingdom if I had to, but Epcot is always a must. I ALWAYS get the hopper option because I don't want to feel tied to one park only. Sometimes I don't use it but I've used it at least once on every trip. However, I'm taking a friend with me next year and she doesn't want to buy the hopper (too expensive), so I'm nervous too! Disney Parks Moms Panel: Is This Your Year?